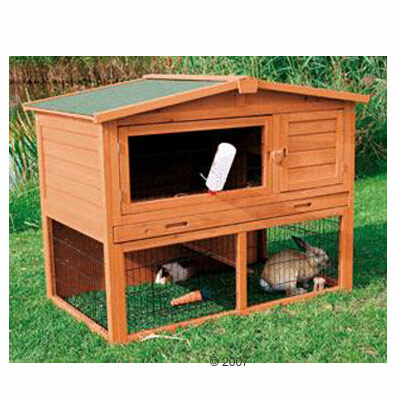 Rabbit Hutch: Trixie Natura Giant with pitched roof and enclosed ground run. The Rabbit Hutch Trixie Natura provides your pet rabbit with the ideal opportunity for exercise due to the built-in ramp and enclosed ground level rabbit run. The rabbit hutch also has an indoor space which can be used as an retreat for sleeping or quiet time for your pet rabbit. The roof can be opened completely so that the rabbit hutch can be cleaned simply and efficiently. Additionally there is a wood door on the front of the rabbit hutch and a hutch door in the lower enclosure on the front and the side. The hutch has a floor drain with closing plug and an easy-care slide-out plastic base tub. The pine is treated with a special stain and similarly the roof is specially coated.